Founder, Carl Haupt, demonstrating with one of the first Rotolite blueprint machines. Rotolite of St. Louis, Inc. has been servicing the needs of architects and engineers since 1959. It's founder, Carl Haupt, was the driving force behind the company and was the president and an active worker in the company until his death in 1995. Rotolite is now managed by his two sons, Paul Haupt, who is vice-president of operations, and Steve Haupt, who is vice-president of sales. 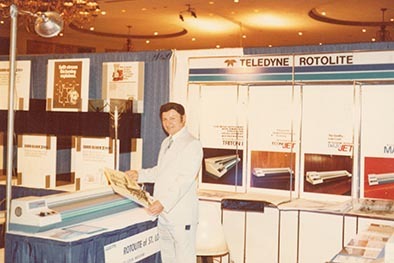 The company started small in 1959, selling the newly released Rotolite blueline machine, but has grown steadily over years. Technology has changed tremendously, and Rotolite stands committed to offering the most reliable and technologically advanced equipment and products to it's customers. Pictured Left: Carl Haupt hard at work. posing with the first of many Top Central Region Xerox Dealer plaques. The average life span of a family-owned business is 24 years. We are proud to be part of the 13% that are passed down successfully to the third generation. The Done Dept. is Rotolite's print and design department, rebranded in 2005 by Greg Haupt, to appeal to a more general audience in the neighborhoods that surround us. The Done Dept. specializes in a wide range of printing and creative projects.